Katherine Waddell, or known by most as Kat Dell, began volunteering at age 12 with World Vision and her local food bank. She has experience in journalism, signage design, and is currently pursuing a degree in Fashion Marketing. She began volunteering with 1Up for Dreamhack Austin 2017 to be able to get a different type of experience from a video game convention. She also had a personal fight with cancer to make her passionate for the cause. Her maternal uncle was suffering from stage 4 kidney cancer and her best friend’s father had just passed away from stage 4 brain cancer. During Dreamhack Austin 2018 she took part in the Streamer Studio, raising money in collaboration with the 1Up booth in honor of her uncle who had passed in late 2017. She became the Promotions Manager for 1Up in late July. 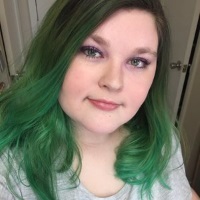 In her free time she enjoys making pinback buttons, streaming creative & variety gaming on Twitch, and working with animals. Her favorite video games include Animal Crossing, Pokémon, Zelda, Dragon Age, and cute indie titles.